In an unprecedented event, the cast of the Star Trek film franchise has created a unique philanthropic initiative in partnership with Omaze. The "Star Trek: To Boldly Go" campaign will support the cast’s personal selection of nine global causes, which will each receive equal portions of the funds raised when fans enter for a chance to win a walk-on role in director Justin Lin’s Star Trek Beyond, the third film in the blockbuster franchise, released on July 8, 2016. The campaign runs from 12:01 a.m. PST on July 14th until 11:59 p.m. PST September 1st. 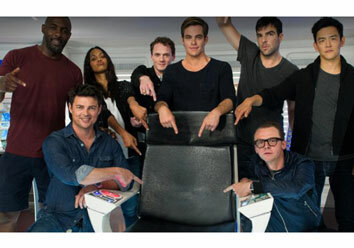 To coincide with the campaign’s launch, cast members John Cho, Simon Pegg, Chris Pine, Zachary Quinto, Zoë Saldana, Karl Urban, Anton Yelchin and Idris Elba recorded a special video message on the iconic Starship Enterprise bridge set. The video, released today, kicked off production and features the cast inviting fans to make franchise history as the first fans to ever win a walk-on role in a Star Trek movie. For each $10 contribution made through the Omaze fundraising platform, eligible participants will be automatically entered for a chance to win this once-in-a-lifetime experience. “Omaze is excited to bring this truly once-in-a-lifetime experience to Star Trek fans around the world,” said Ryan Cummins, Co-Founder and Co-CEO. Direct Relief International, one of the premiere disaster relief organizations that operates worldwide. Nominated by Zachary Quinto. Make-A-Wish, whose remarkable work is making wishes come true every day for children suffering from life-threatening illnesses. Nominated by Chris Pine. Visit Omaze.com/StarTrek to learn more about this new initiative.